A couple of weeks ago I took Robert Hammond of RH wine to visit some of my favourite wineries in Montefalco. Robert was familiar with the Sangiovese based wines of Tuscany such as Chianti, Vino Nobile di Montepulciano and Brunello. However, he had never tried the wines made from the tannic Sagrantino grape in the Montefalco area of Umbria. We visited Di Filippo, Dionigi, Fongoli and Pardi, Robert was seriously impressed with the wines we tried and this didn’t just include the reds, he came away with bottles of dry Sagrantino, Sagrantino passito (sweet wine made from dried grapes) and white wines made from Grechetto and Trebbiano Spoletino. Robert said if he could only drink wine from one country he would choose Italy as there was always something new to discover – Italy has over six hundred varieties of wine grape and a huge range of climate. 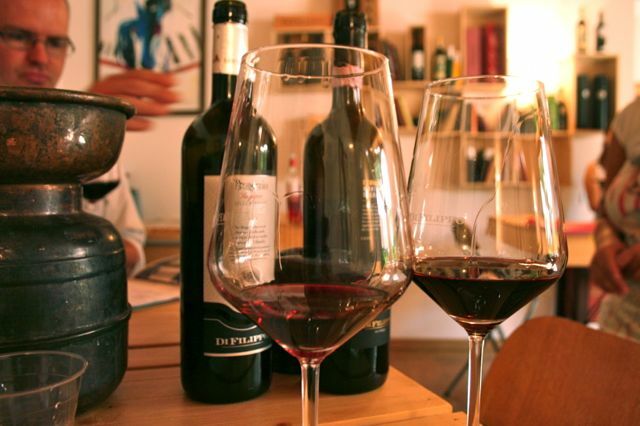 Sagrantino di Montefalco and Chianti are grown within a hundred kilometres of each other but these big red wines are hugely different in character.